CActions, CActionsSnoozeAndDismiss, CAdaptiveGroup, CAdaptiveImage, CAdaptiveSubgroup, CAdaptiveText, CAppLogo, CAttributionText, CAudio, CButton, CButtonDismiss, CButtonSnooze, CContextMenuItem, CGenericBinding, CGenericImage, CGenericText, CHeroImage, CProgressBar, CSelectionBox, CSelectionBoxItem, CTextBox, CVisual & CWin81Binding are all the sub classes used by CContent. The enclosed zip file contains the Toast++ source code and a VC 2017 MFC dialog based application which demonstrates most of the classes functionality. Provides one C++ Header only module to encapsulate the Windows Toast Notifications most useful to desktop developers. Specifically ToastPP::CToast encapsulates a Windows::UI::Notifications::ToastNotification WinRT class and ToastPP:CManager encapsulates a Windows::UI::Notifications::ToastNotifier class. The demo app also includes a fully worked example of using INotificationActivationCallback to implement a COM server which gets notifications from Action Center in your Desktop Win32 application. Included in the download is a VC 2017 MFC dialog based application which exercises the Toast++ classes functionality as well as allowing you to try out different style toasts. 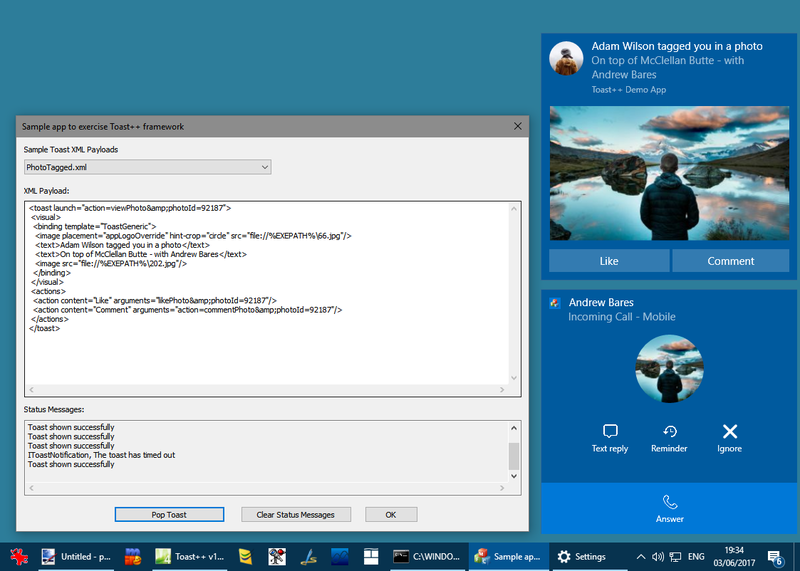 The toast samples provided in the demo app are based on the samples included in the Notifications Visualizer for Windows 10 store application. Updated the sample app to compile against the Windows 10.0.11763.0 SDK which eliminates various VS compiler errors when the code is compiled against earlier versions of the Windows 10 SDK. Added a number of missing files to the download. Thanks to Mikko Saariki for reporting this issue.